Ride and Read! NEWS by Madness Photography - Onno "Berserk" Wieringa: 1966 Triumph Bonneville TT Special, a National Motorcycle Museum exclusive. 1966 Triumph Bonneville TT Special, a National Motorcycle Museum exclusive. a National Motorcycle Museum exclusive. 1966 Triumph Bonneville TT Special - A special race-only model of the T120R Bonneville originally conceived for the 1963 model year as a T120C, the TT Special was a high performance factory race bike, stripped down and performance tuned for dirt track racing. First available with the TT designation in 1966 it was also manufactured in 1967 when only 900 TT Specials were built. 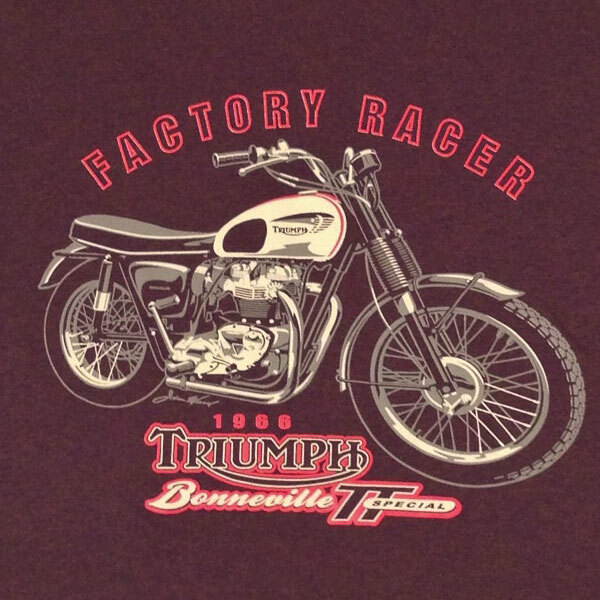 The Triumph factory racer came with a lighter crankshaft, Amal Monoblock carburetors, higher compression pistons, hotter camshafts and a high output ignition system to produce 54hp at 6,500 rpm. Closer ratio gears were installed in the four speed gearbox, final drive ratios were altered, and larger diameter exhaust pipes were tucked under the frame; no mufflers were used. Aluminum, or more durable stainless steel fenders replaced standard street fenders. Lights, fork lock and speedometer were deleted; only a tachometer was fitted. The forks received special springs and internal valving. The smaller Bonneville-derived 2.5 gallon fuel tanks came with special paint schemes; white with orange racing stripes for 1966, aubergine over either gold or white for 1967, both pin-striped in gold by hand. In addition to making a fine dirt track racer, the TT Special served many racers as a drag bike, desert sled and occasionally even a hill climber. Some, like this TT Special, were equipped with lights and ridden on the street. In 1968, Evil Knievel jumped the Caesar's Palace Casino fountains on a Bonneville T120TT. He sustained serious injuries but the mystique of the Bonneville T120TT increased in the eye of the public. This fine TT Special is on loan to the Museum from Richard Betchkel. 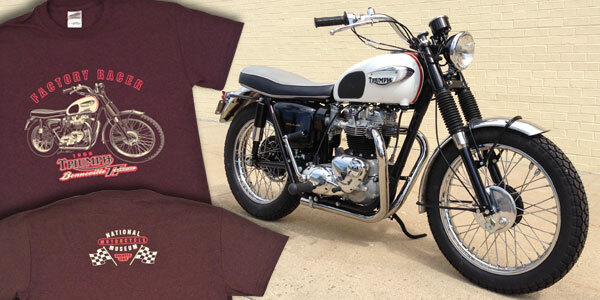 A National Motorcycle Museum exclusive, the design of this Russett T-Shirt is inspired by the 1966 Triumph Bonneville TT Special currently on display at the National Motorcycle Museum in Anamosa, Iowa. Pre-shrunk T-Shirt is a 50% cotton/50% polyester blend. Gildan brand.